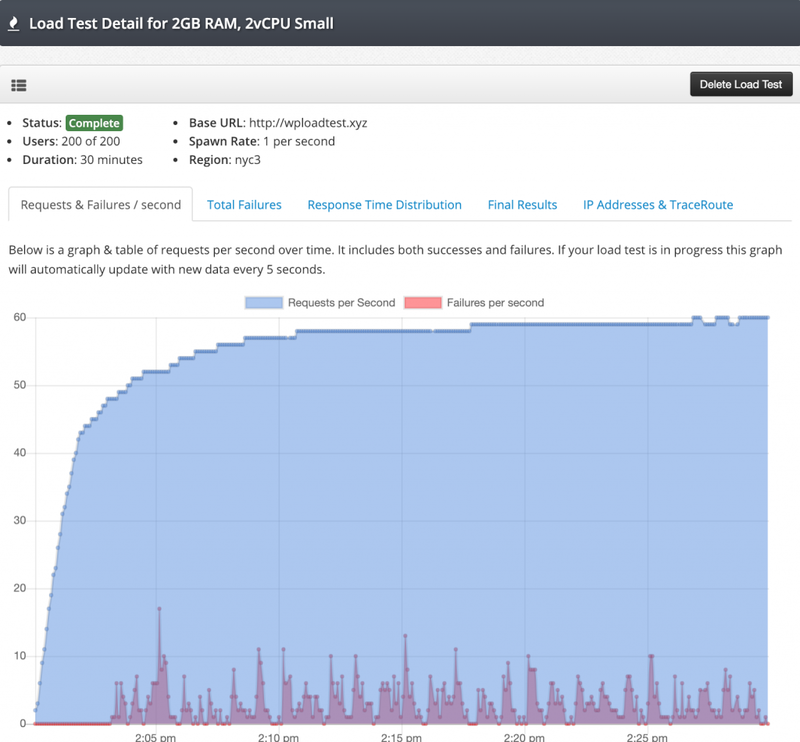 Want to performance test your own WordPress site? 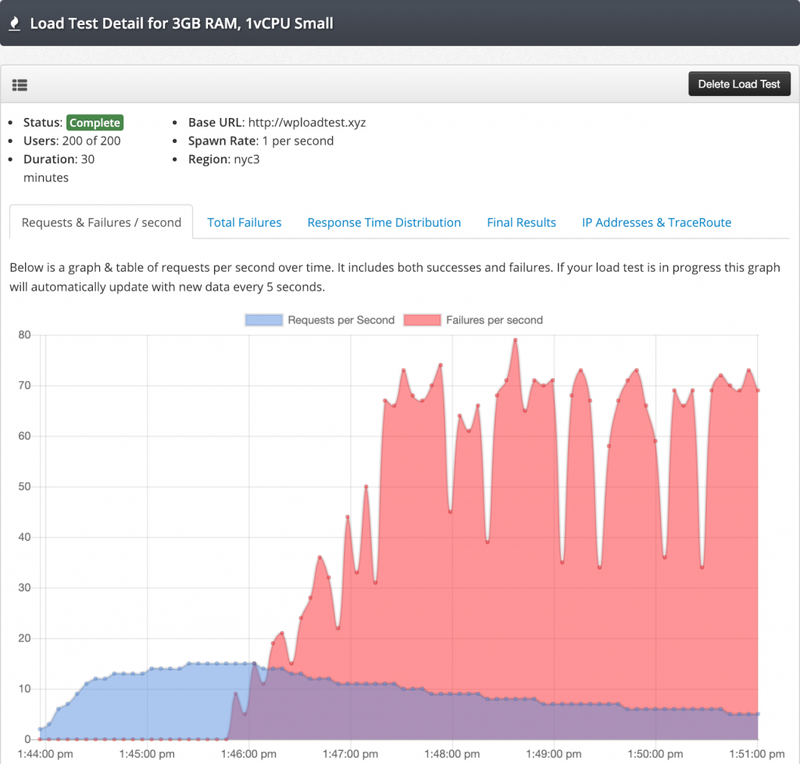 Try Kernl WordPress Load Testing! I recently re-discovered these plans and thought to myself “Jack, you should load test these configurations and see which is better for WordPress!”. So here we are, attempting to answer the age-old question “Is RAM or CPU more important for WordPress performance?”. The WordPress server location was in Digital Ocean’s London (lon1) data center and the load generators were located in Digital Ocean’s New York City 3 (nyc3) data center. 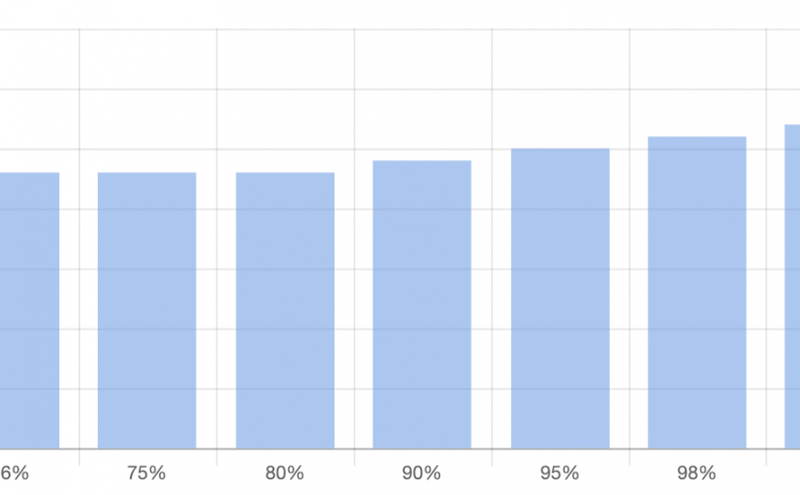 No caching was used for this test because I wanted to test WordPress performance, not caching plugin performance. The test WordPress site was populated with a WP export dump of this blog. That means that the test skewed extremely read-heavy. Your results may be different for a site that is write-heavy, but experience tells me that this probably isn’t true given how chatty WordPress is with MySQL in most situations. The first test that I ran against the $15 droplet was with the 3GB RAM and 1 vCPU configuration. I had expected this to perform the worst out of any of the configurations due to WordPress generally being CPU bound when it comes to performance. As you can see things went OK until we hit around 18 requests per second, and then everything went off the rails. This isn’t too surprising as I didn’t have any caching plugins installed. This is just raw WordPress with MySQL (MariaDB). I ended up killing the load test after 7 minutes because it was clear what the results were. The response time distribution was also pretty terrible with a 99th percentile of slightly over 5 seconds. Next up was the 2GB of RAM with 2 vCPUs $15 configuration. I had actually thought that this configuration would perform the best due to the nice balance of RAM and CPUs. It performed better than the first test, but it wasn’t the best. As you can see we had far fewer errors this time and were able to reach 60 requests per second. For those doing the math that is 3.3x better performance than a single vCPU (for the same price!). 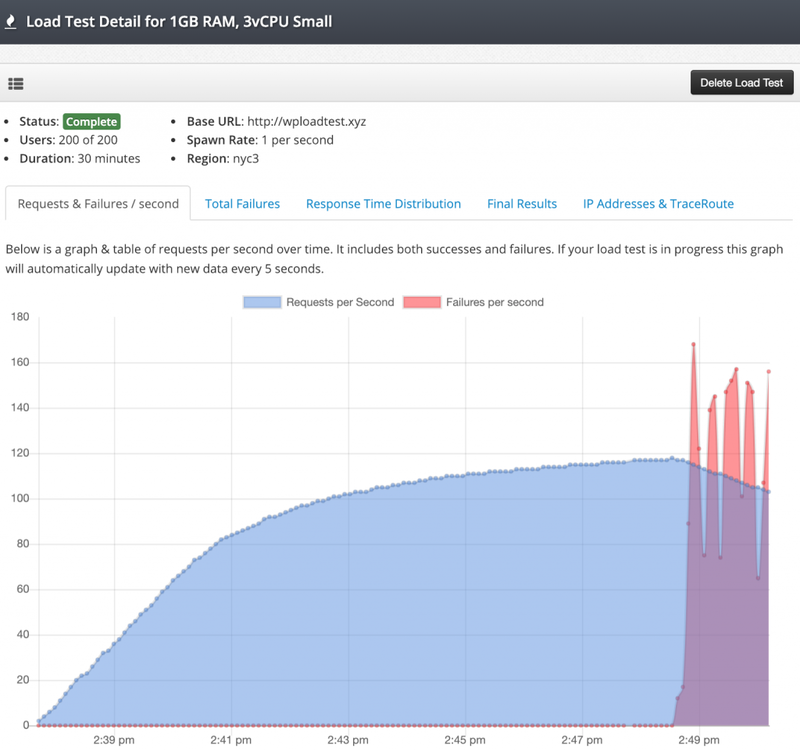 The response time distribution was starting to look better with 2 vCPUs as well. The 99th percentile was ~2.7 seconds which isn’t too bad while serving 60 requests per second (5.1 million requests per day). Finally I tested the 1GB RAM, 3 vCPUs $15 configuration. Personally I thought that this would perform 2nd best because I figured the server would become RAM starved while trying to server more requests. I was wrong. So for the same price as the 3GB RAM, 1 vCPU server we can get 6.5x the performance by simply choosing the configuration with more CPU availability. We peaked at around 118 requests per second (10.1 million requests per day) and then it started to trail off as we started to see errors. The response time distribution was pretty excellent here and started to look like what we would see from high performance servers (1 big outlier with generally good response times across the rest of the spectrum). With the 99th percentile at 700ms it seems like a no-brainer to go with more vCPUs. It seems obvious from the data presented above that you are always better off going with more vCPUs than RAM, but I hesitate to always recommend that because reality is more complicated. There are likely situations where a good balance of RAM and vCPUs would perform better (lots of image uploads and processing for example). So what does this all mean? In most cases you are probably better off with more vCPUs instead of more RAM. However, I strongly recommend that you do some load testing to make sure that this is true for your WordPress site.